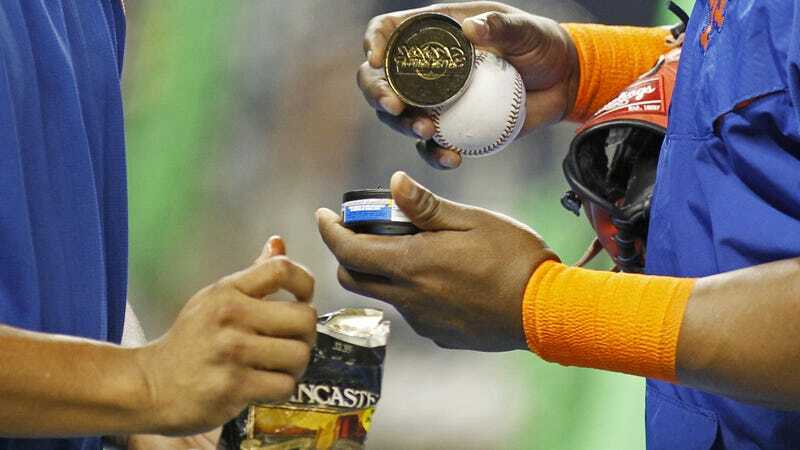 As part of baseball’s new Collective Bargaining Agreement, which was finalized late Wednesday night, MLB and the MLBPA agreed to a ban on smokeless tobacco for new major leaguers going forward, according to the Associated Press. City-specific bans already apply to ballparks in Boston, Chicago, Los Angeles, New York, San Francisco, Milwaukee, and D.C. Advocacy groups have been working for years to cut down on the ambient affiliation between baseball and tobacco, with limited success. The cause received an unfortunate boost in 2014 when Tony Gwynn died of cancer at the age of 54. His family contends that his decades-long chewing tobacco habit directly contributed to his untimely death, and earlier this year they brought a negligence and product liability lawsuit against Altria Group Inc., formerly the Philip Morris company, one of the largest tobacco companies in the world. Another issue the lawsuit raises is baseball’s historically cozy relationship with Big Tobacco, which has counted Babe Ruth, Ted Williams and Lou Gehrig among its pitchmen. While players were forbidden to shill for tobacco companies after the 1964 surgeon general’s report, violators were only fined. Tobacco companies spun smokeless tobacco as the healthier alternative, and the dips and chews often came in a variety of sweet, kid-friendly flavors like “warm winter toffee” and “midnight berry.” Chewing tobacco is still advertised widely, including in SPORTS ILLUSTRATED. Warning labels noting that the product increased the risk of cancer, gum disease and tooth loss didn’t appear on the packaging until 1987. By then, Gwynn had been dipping for 10 years. He was clipping coupons and sending away for free samples. And the tobacco companies had launched a relentless marketing and advertising offensive that targeted African-American men, the Gwynn family lawsuit alleges. The new blanket ban on dip comes after a series of half measures hard-won by the league were met with limited support among players. Last year, they brought in a “smokeless tobacco cessation consultant” and banned dip tins from the playing fields. But the players’ union specifically rejected a league-wide ban during the last CBA negotiations, and SI quotes Bud Selig as saying, “We discussed this with the union over and over.” And after San Francisco banned all smokeless tobacco in the ballpark at the start of last season, The Mercury News conducted an anonymous survey of 25 Giants players that found only three of them supported the ban. Not that bans necessarily work. In the anonymous survey of Giants players, two of the 25 admitted they did not plan to comply—perhaps because the punishment is a relatively mild fine of $100, $250, or $500 depending on the number of offenses. Smokeless tobacco has been banned at the minor league and college level since the early 1990s. The NCAA is particularly harsh, ejecting both a player and his manager if he’s caught with dip during a game. And yet a 2013 study of 21,000 college athletes across sports found that 47.2 percent of baseball players still used smokeless tobacco. The new ban doesn’t apply to anyone with even a single game of major league service (another example of the CBA willing to trade the interests of current non-members to get a better deal for themselves). This means that it could take upwards of 10-15 years for dip to fully phase out as even rookies now will be grandfathered in, and it’s hard to imagine policing use in a locker room where determining legal use will require whistleblowers to look up a player’s debut date. A minor leaguer we spoke to said the ban at the major league level will likely limit how many of his peers dip. The details of how the new ban will be enforced have yet to be made public but at the minor leaguer level managers, as well as the player who dips, are slapped with fines, putting pressure on management to curtail use among their team. That said, the designated “dip police” who inspect the clubhouses are not allowed to dig through a player’s locker, and managers are unlikely whistleblowers when they risk a fine themselves. Trying to snap the strong association between baseball and chewing tobacco is an admirable goal and one that players are rightfully required to get on board with—regardless of what they might do in the offseason. The long-game approach taken by the new CBA ban is probably the most realistic way to legislate that shift, but it remains to be seen if the the methods for policing usage will be at all effective.